Suzanne Church juggles her time between throwing her characters to the lions and chillin' like a villain with her two sons. She writes Science Fiction, Fantasy, and Horror because she enjoys them all and hates to play favorites. Her award-winning fiction has appeared in Clarkesworld, Cicada and On Spec, and in several anthologies including Urban Green Man and When the Hero Comes Home 2. Her collection of short fiction, "Elements" is available at bookstores and Amazon from EDGE Science Fiction and Fantasy Publishing. 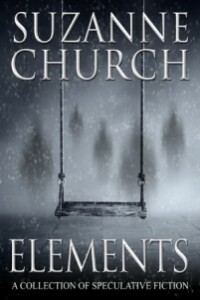 ELEMENTS: A Collection of Speculative Fiction will be released on April 1st in Canada and April 30th in the US. Suzanne will be visiting five cities as part of the book tour. Saturday, April 5th, 9:00 PM at Ad Astra convention. The big launch PARTY! If you’re planning on attending the convention, please drop by and celebrate. There will be cake! Saturday, April 12th, 1:00 PM at Chapters Waterloo. Suzanne will answer questions and do a few short readings from the collection. Suzanne will read a few short excerpts from stories in the collection. Added bonus: Sandra Kasturi, co-founder of ChiZine Publications, will also be at the launch. Sandra wrote the introduction to the book. As part of the one-day free conference GenreCon, one hour of the day will be dedicated to a launch for ELEMENTS.